BBC SPORT | Motorsport | MotoGP | Rider celebrates 125cc victory - one lap too soon! Rider celebrates 125cc victory - one lap too soon! 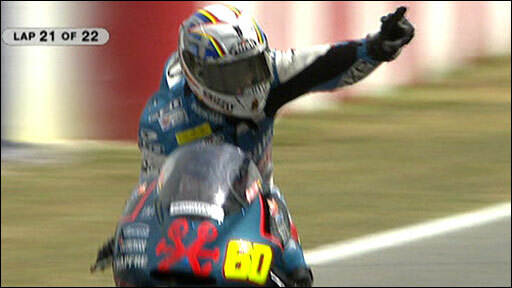 Julian Simon crosses the line and celebrates victory in the Catalunya 125cc MotoGP, but there is still one lap to go.